The Critical Spatial Practice reading group is merging with the Law, Race & Space reading group in 2008-2009. 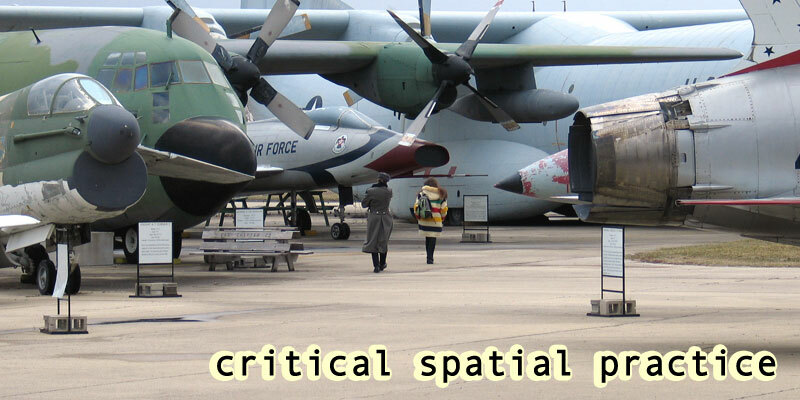 We propose to investigate critical theories of space and place and what the architectural historian Jane Rendell has termed "critical spatial practice," the relationship between spatial theory and critical practice. The group's focus will shift accordingly between consideration of key theoretical texts and in-depth research and discussion about contemporary practices and their historical antecedents that mobilize(d) spatial theory and employ(ed) a range of experimental interpretative strategies. Practitioners include a number of groups based in the United States and Europe (1), but also activities by those who have utilized similar strategies, but worked outside of an intentionally aesthetic context (2 & 3). Literary works such as Paul Carter's 1987 The Road to Botany Bay and William Least Heat-Moon's 1991 PrairyErth, theatrical performances such as Mike Pearson's "Bubbling Tom" and Tim Brennan's "Mercator Manoeuvre," and experimental academic texts such as Deterritorialisations…Revisioning Landscapes and Politics, edited by Mark Dorrian and Gillian Rose (2003), The Unknown City: Contesting Architecture and Social Space, edited by Iain Borden and Jane Rendell (2001), ELSE/WHERE: Mapping - New Cartographies of Networks and Territories, edited by Janet Abrams and Peter Hall, and Possible Urban Worlds by the International Network for Urban Research and Action (1998) can further inform our investigations. In recent years a number of organizations and projects have emerged that aim to cultivate a "progressive sense of place" (Doreen Massey). The reformulation of place as an open set of relations is accomplished by interrogating inherited notions of place and community; confronting both conflicting and normative dimensions of landscape; situating the particulars of place within structural systems of organization and occupied space; and exposing means of production and articulations of power. This critical approach is consistent with W.J.T. Mitchell's straightforward assertion that "[a]n account of landscape has to trace the process by which landscape effaces its own readability and naturalizes itself." Many of the organizations and projects mentioned draw extensively from the intellectual thread that analyzes modes of production – beginning with the production of capital (Marx, David Harvey), and extending to the production of space (Henri Lefebvre, Edward Soja), the production of scale (Neil Smith, Don Mitchell, Andrew Herod), the production of mobility (Tim Cresswell, Jane Rendell), and also theories of practice and the everyday (Michel de Certeau, Pierre Bourdieu). Two projects that exemplify and model strategic and accessible applications in real space are Platform's "Loot! Reckoning with the East India Company," and Trevor Paglen's "expeditions" to secret military bases of the American West. Although they deal with opposite ends of a spectrum that constitutes the military-industrial complex, both projects attempt to spatialize discourses of globalization, reveal complex imbrications of scale, and provide concrete points of entry into otherwise diffuse networks and obscured histories. Political theorist Margaret Kohn has noted that "[t]he political power of place comes from its ability to link the social, symbolic, and experiential dimensions of space." This reading group proposes to separate, juxtapose, and recombine some of these spatial dimensions. Building on previous conceptual work, we propose both to research practice and practice research. This would entail developing a theoretical framework for "critical spatial practice," and then using these various methodologies rather than simply analyzing them from afar. What happens when these theories and practices are applied to the specific histories, landscapes, and politics of our neck of the woods in east-central Illinois? In response to these questions, we envision this reading group functioning as an important first step toward the eventual development of a longer-term collaborative project akin to – for example – The Center for Land Use Interpretation, which would serve as a regional forum for critical spatial practitioners and facilitate interpretative experimentation and additional methodological research. It's important to us that this project have a local component. Thorny questions confronted across the globe have local variants that affect housing, commercial developments, and environmental policies, to name a few recent controversies. The citizens who just protested the site selection for a new Champaign school, for example, were essentially responding to racialized spatial patterns in our communities. This reading group can provide one forum for assessing conflicting priorities about uses of space and power, nearby and far away. We would like to bring in one or two speakers who could address aspects of spatial practice. This reading group will expand on discussion initiated in the 2004-05 "Walking as Knowing" Reading Group and the 2004-06 "Performance Studies Working Group." 1. Platform (London), Multiplicity (Milan), The Center for Urban Pedagogy (New York), The Center for Land Use Interpretation (California), Appalshop (Kentucky), Trevor Paglen (California), Invisible-5 (California) and Bureau d'études (Paris). 2. Xapuri Rural Worker's Union (Brazil), Mothers of the Plaza de Mayo (Argentina), and collective endeavors such as RETORT in San Francisco as well as the “This Land Is Ours” movement in Britain. 3. The People's Geography Project (Syracuse), Civic Studio (Grand Valley State), Center for Working-Class Studies (Youngstown State), Community Economies (Australian National University), and Social Movements Working Group (UNC-Chapel Hill), The Vera List Center for Art and Politics (The New School), and The Center for Place, Culture, & Politics (The Graduate Center - CUNY).